Michale Graves is a singer/actor who first burst onto the music scene as the front-man for the mid 1990’s reincarnation of the seminal punk rock band The Misfits. Since his departure from the group Michale has enjoyed a successful solo career and appeared in a number of different short film projects. 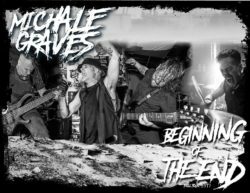 Media Mikes had the chance to speak with Michale about his career and his recently announced “Beginning of the End” tour which has him and his band revisiting all aspects on the singers 20+ year music career. Adam Lawton: What was going on with the Misfits at the time of your departure? 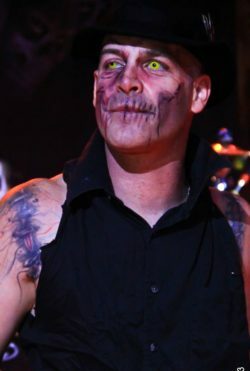 Michale Graves: There was a lot going which led up to the bands break up in Orlando. There were a lot of things going on that were dysfunctional for the band. Looking back having been removed from the situation for almost 20 years now, I was a difficult young man to deal with at times. Here I am the lead singer of one of the most influential/popular punk rock band of all time. I was difficult at times. With that being said I contributed an awful lot of work to that bands vision, soul and direction. I was very much a huge reason the team we started off as was experiencing so much success. After the “American Psycho” album especially I wasn’t really being respected for what I brought to the band. I was being treated like and unruly, bothersome kid. If I said something that wasn’t liked I was told that if I didn’t like what was going on I could go home as there were a 100 people willing to take my place. That didn’t make me feel very special. That was a very disrespectful place for those core guys to take. Things were a real mess at the end. Guys didn’t talk or stand up for each so everyone was practically alienated from one another. We weren’t a team anymore with the same goal in mind. Things were just a mess. I decided to give it all up so I could keep my integrity and not be some sort of yes man for a thing I helped build. Everything aside when the four of us were together we were a great band. When we were a unit we working together we were great! It’s sad and unfortunate that things drove us apart. AL: After the Misfits you started a solo career and also working with other artists such as Marky Ramone. What was it like being out from under a band and being able to do your own thing? MG: It was very tough at first. I worked with Dr. Chud still for a bit after we left the Misfits but it was hard. That was a starting over point for me. By the time I started working with Marky I very confident in my ability and I was in great shape. I had it in my mind that there was no other person aside from Joey that could sing those songs as good as me. That was a highlight of my career for sure. Getting to perform and talk with Marky was just great. To be around that crew was very special. I remember when all those guys were alive and still the Ramones. Being from New Jersey I was in the same circle as all those guys. They were always around so all those years later to be the guy with Marky and be privy to certain conversations it was an incredible time for me. We were a great band. AL: In April you released your first live DVD titled “Black Thorn 51 Live” can you tell us about that? MG: We filmed that in Queens, NY as a three piece. Mikey Pain is playing bass and Tony Baptist is on drums. There had been a shortage of high quality, high produced videos of us performing that I felt like we needed to put something out. We taped the show and after listening to it we felt it sounded really good so we pulled the trigger. This is the tip of the iceberg for what is coming. Right now I am focusing on a major uptick in video production and content across my social sites including my new official site that is being built. There’s going to be a lot more content coming out. I am feeling a momentum with my career right now that making for an exciting time. A lot of my stuff has been very scattered which I think has made it harder for people to grasp what I am doing so I am working on consolidating all of that in hopes of providing a clearer vision for people. AL: You have started appearing in a number of short films recently. Can you tell us about that? MG: A couple years ago I partnered with Mark Allen Stuart to create a company called Hydraulic Entertainment. That’s where all my past records live. There is a ton of music we produced through that company. Most of the films that have been done are ones that Mark has come up with. He would write and produce them and then I would appear in them. For me as an artist I was able to step away from the writing role and jump into the acting side of things. We have started with short films to help us get our feet wet in an effort to create bigger things. There is defiantly a lot more to come. I am working on a project right now that has me both behind and in front of the camera. We have a lot of talented, motivated people in the industry with us on this. It’s pretty exciting. AL: For you was it film or music that grabbed your attention/interest first? MG: I think it was music first for me. My earliest memories related to music come from listening to records and the radio with my uncle. I always remember music having a profound effect on me. When I listen to music as strange as it may sound it’s almost like I can see it. It stirs something inside me that causes all these other internal things to start up. Acting quickly followed but things have just been all encompassing really. I have always had this urge to communicate. AL: Can you tell us about the “Beginning of the End” tour you just kicked off? MG: This is a very large tour. We are going to be trying to cover as much ground as we can in an effort to raise my visibility within the industry and get myself in front of fans who might not realize what I have been doing as of late. I have found there’s a good chunk of people who the last time they saw me was 1999. This new show is a powerful, physical assault. We are playing all of the legacy Misfits songs that people love. We are playing tons of songs from the “American Psycho” and “Famous Monsters” albums. We are doing around 30 songs a night and I have brought back the make-up to help showcase the story I try to create each night over the course of our set. If fans want to meet me I am super accessible at each show as I enjoy meeting and talking with everyone so please come out and say hello.